This Colt is such an effective tool, I think we have to have a competitive advantage over every school not using it. A team captain as a defensive lineman at North Carolina, Burton played in the NFL for four years before beginning his college coaching career as a graduate assistant at UNC in 1992. In his first season at MSU in 2013, the Spartans’ defensive line showed remarkable improvement as a disruptive force, improving their sack and tackle-for-loss totals over the previous season. The improved defensive line was a key component helping Michigan State win a school-record 13 games, including a win over 5th-ranked Stanford in the Rose Bowl. 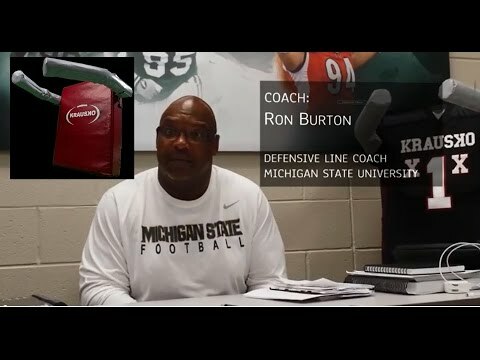 For his work with the Spartans’ linemen, FootballScoop.com named Burton their 2013 college defensive line coach of the year. Jeff Kraus: YES. You are never on the field standing still, never, nor is your opponent, and there’s so much of that, it drives me crazy. Ron Burton: The advantage of The Colt is the fact that it’s very adjustable, you can move it around on a person. Inside players, we don’t mind them being inside the frame, the D-tackles, we do want them to work to half a man, but a lot of times the wind up zeroes out and they have to work their way. And defense ends, they are out a little wider. They’re outside, they’re at a position where they can strike and work a half man, so they start that way but then they get over-set and [have to] be able to counter back. We really utilize both positions heavy, and half-a-man position, because you’re going to end up sometimes back in the middle. Jeff Kraus: Do you like that the Arms Spring Back? Ron Burton: YES. Because that’s what the offensive lineman is going to do, as you knock his hands down he’s going to reset that hand or arm back at you, and this automatically does that. So it gives you a repetitiveness and a QUICKER reaction than even the offensive man can because it recoils back. It’s great for repetitive drills—whether you’re chopping down, chopping up, level rush, low to high, high to low, club rip—it gives you instant feedback as far as pad level is concerned. The other drill we like to use it on is called “violent hands”. That’s a big drill for us, we show a physicalness mentality, and taking it out on the Colt has been very good for us. I mean when I first saw it and saw it up close that’s the first thing I thought, “Well, how long will these arms last on this shield?” And after utilizing it these last few months, I can tell that it’s just as durable as the first day we received it and used it. You’re still getting all the movements you want out of it, because it’s moving around, you can move yourself around, it’s constantly in motion, its constantly in a position where a guy can redirect, he can flip around, he can still be able to utilize high- and low-leverage wise, and left-to-right. That’s what we like about it, so it’s still very mobile for us. It’s great for when you have no pads on, you can continue to get the aggressiveness out of the kids. They don’t feel like they need to hesitate, they can be super aggressive on it. Jeff Kraus: Do you use it with your defensive ends and defensive tackles? Ron Burton: Specifically on non-padded days, that’s when we’re able to utilize it, it creates repetitiveness, you can work down the line and create situations where the kids, they’re not damaging themselves, can work down the line, and based on their body placements and their arms placement and their body placement, you get instant feedback from it. Des, that’s where we start to use it early, then later we work on our down-the-line drills where we work with our club and rips, our figure 8s, get multiple reps out of it as we work back and forth. I think every D-line coach should have 2 Colts. Everywhere from O-line to wide receivers coach to linebackers, everyone should have the chance to add this. I think everybody wants one. So let’s continue to use it. Start training your players with The Colt football blocking pad with arms today and see improvement on gameday. Copyright 2019 Krausko LLC. All Rights Reserved. Muzzle Sled Dawg Strength & Fitness Train Right. Win More.